It's all relative(s)! : Ever have a deja-vu that you can never shake? Ever have a deja-vu that you can never shake? Ever experienced deja-vu that was so real you could taste it? Family trips to Melton Mowbray were always something special for me. Whether to the swimming pool, where my sisters and I learned to swim, our Dad swimming sidestroke but teaching us the right way to go, or on special days during the school holidays, to Melton's cattle market, to see all the livestock from bantam chickens to huge bulls, squealing pigs, and gentle sheep and cows. Or the stalls on the streets of the town, selling cheese and clothes and all the sweets in the world, and the old pork pie shop and the bakers' scenting the air with freshly-baked, crusty bread. We used to explore places that we shouldn't; tumble-down buildings that were scheduled for demolition, like the big house to the left of the bridge in this photo of old Melton; empty, abandoned, why couldn't it be made safe and pretty again? There were other, less grand, abandoned houses that we explored, mostly around the area that is now paved over and rebuilt, the area of town that Norman Way now runs right through. These were terraced houses, workers' cottages, rundown, tumbledown, empty of the people who once called them home. Curtains behind broken glass, peeling wallpaper, a broken teacup; doors creaking in the breeze. One day, I walked through the door of one of these abandoned, Melton Mowbray homes, and was struck with such a feeling of deja-vu that I can remember it to this day. The scent of the damp wallpaper and the cold soot in the fireplace. The way the light fell through the window. The sensation of moving through low doorways. The holes in the plaster ceiling. The floor, maybe it was flagstone, maybe quarry tile, I don't think it was wood. Being in a very a small room, and then another, out to the back of the house. Like I'd been there before, but I had never, ever opened the door to that house on an old street in Melton. It's a strange feeling, that depth of deja-vu. Unnerving, even; yet somehow comforting, too. A bit like going home. I turned the page and saw this photo... and had the deja-vu, all over again. That was the house! That's the one that I remembered in the house in Melton! But why? 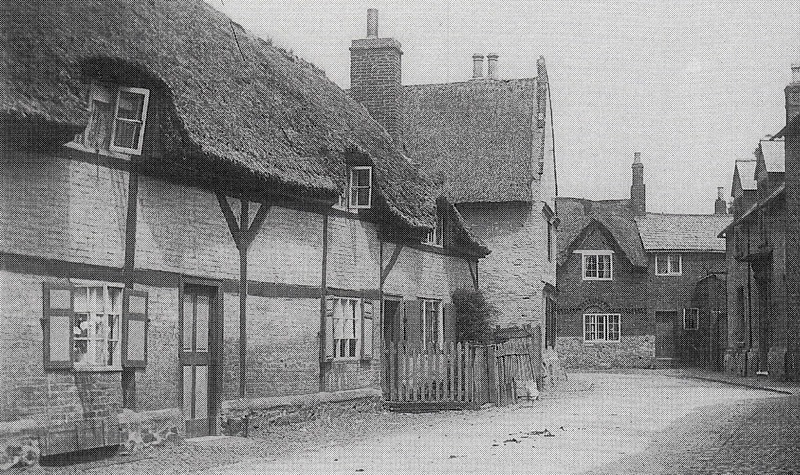 The houses don't look the same; the one in Melton was a red-brick terrace; this, an ancient cruck cottage, with a thatched roof and wooden beams. But... I saw this photo, and the sensation came back, even stronger than before. I had never seen this photo before. The cottages to the left of this photo were on Lower Church Street and would have faced the main door in the tower of St Peter's and St Paul's church. The cottages are long gone; they were replaced by the church hall and its car park. The cobble pavements are gone, replaced by tarmac and concrete. I had no memory of these cottages from my childhood or teen years, and I was on that street at least once each and every week of my youth. And yet: seeing this photo triggered what must be my earliest memory. I was being carried through a tumble-down house; the smell of damp, peeling wallpaper, a forgotten picture on the wall, an old fireplace smelling of soot; curtains behind broken glass, a stooped doorway, a home empty of its people. Grandad Fred Toon had a vegetable garden on the land which later became the car park for the village hall. The cottages were demolished very, very early during my lifetime. I think my Dad carried me through the abandoned cottage, to visit his father who was working in his garden. Maybe my pram was left in the street, in front of the cottage, and he just picked me up and carried me through, a short-cut to Grandad Fred. That's where I think the deja-vu came from. I could be wrong; this might all be my imagination, or someone else's story. All I know: I knew that cottage, and at some point in this life or another, someone carried me through it.